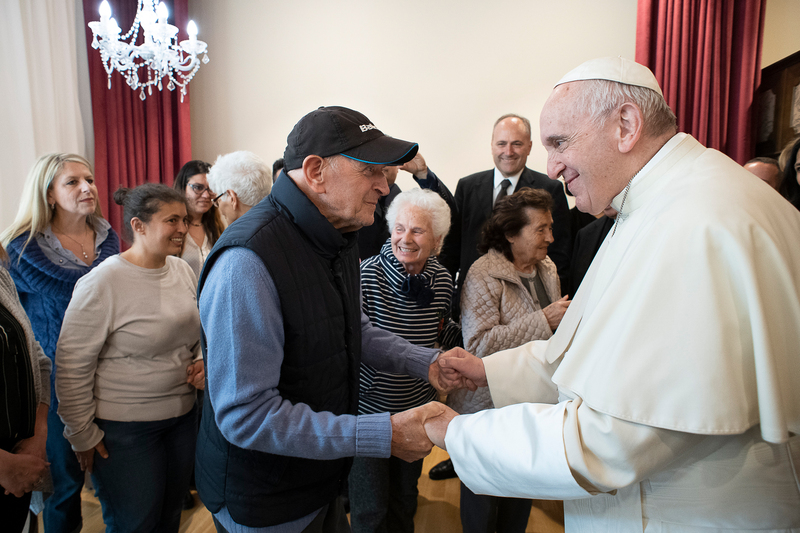 Pope Francis, as part of the Mercy Friday pastoral initiative that began during the Jubilee of Mercy, paid a visit on the afternoon of April 12, 2019, to the Villaggio Emanuele, an institution for people with Alzheimer’s, accompanied by H.E. Msgr. Rino Fisichella, president of the Pontifical Council for New Evangelization. The Villaggio is truly organized like a village, and its inhabitants can live in normal conditions, carrying out many aspects of their daily life, necessary for those who live with this difficult disease, thus creating and maintaining a bridge of communication with the outside world. The village, named after its founder, Professor Emmanuele F.M. Emanuele, honorary professor of the Roma Foundation, an innovator in domestic care of Alzheimer’s sufferers, is the only one of its kind in Italy and arose from the awareness that Alzheimer’s has now become a social priority and necessitates a model of care that ensures a lifestyle as close to normality as possible during the often long progression of the disease. The Villaggio Emanuele is made up of fourteen houses, each one of which is suitable for six people. There is also a mini supermarket, a bar, a restaurant, and a beauty salon. The residents can shop in the supermarket, help in the kitchen, and engage in everyday tasks, in this way conserving their sense of reality and their own identity. Each apartment is furnished in a manner as similar as possible to the home they lived in previously, and the resident does not have a “typical day”, inasmuch as each person can decide how to spend their day. Within the structure, there are doctors, psychologists, physiotherapists, and various other healthcare professionals, and assistance is entirely free of charge. The unexpected arrival of the Pope by car in the courtyard of the village was a source of surprise and joy to the residents, with whom the Holy Father spoke – accompanied by the honorary professor of the Roma Foundation, Emanuel, and the current president Franco Parasassi – and in some cases visited in their rooms. With this visit, the Pope wished to show his interest in the condition of social exclusion and solitude that a disease such as Alzheimer’s can cause in sufferers, as well as disorientation, discomfort, and suffering in their families.